...For a more affordable take on this trend, try French Connection's New Construction Dress, on sale for $99.99 at FrenchConnection.com. 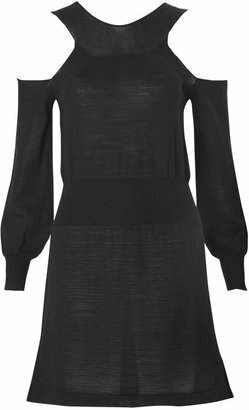 I actually prefer the long sleeves on this dress, looks very Norma Kamali to me.Click any image for details or to purchase. I'm simply not sure how flattering this look could really be. Would you be so kind as to give us some examples of celebs who've rocked this kind of dress? I don't find that Halo dress flattering at all. I like the French Connection one loads better. Although I am unsure of whether I would commit to buying and wearing a piece like this. Its almost as if they started out with a plain ole dress that they found boring so, they just started chopping away.